Did you know that you could play the most loved family game under water? Well, now you can. At least, virtually so! 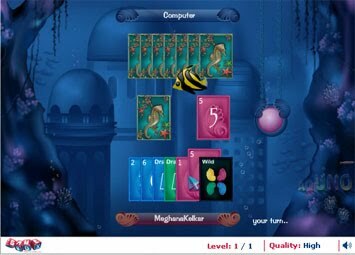 Aquno is a game that is played exactly like the original card game, but packed in a ‘cool’ aquatic avatar… only by TheGameBox! And guess what! No shouting UNO either!! Play the game exactly as you would with your friend. You even have different fish giving you company every once in a while! No diving gear required for this one; simply click away to your win! Match your card by colour or number with the open card. ‘Skip’ card enables you or your opponent to skip a turn. ‘Reverse’ card reverses the turn for the player. ‘Wild’ card lets you choose a colour for your next throw. ‘Draw Two’ makes the opponent draw two cards from the centre deck. ‘Draw Four’ makes the opponent draw four cards and choose the colour for the next throw. When no move is possible from your cards, draw one at a time from the centre deck. Finish your cards before your opponent to win the game.